Let's explore the features for the best premium resorts that would provide wanderers plenty opportunities to enjoy the charismatic Munnar hill station. Munnar is the mesmerizing land of tea estates, greenery, wildlife, rolling hills, and has always persisted as a mystery for generations. When you split the word Munnar, it is like �Moonnu Aaru�, which literally symbolizes three Rivers such as Muthirapuzha, Nallathani stream and Kundala River. It is one of the best idyllic hill station in Kerala, the God�s Own Country located at the height of 5,200 feet above the sea level, it is formerly famous as a summer resort tourists zones for the British. Now it becomes one of the popular tourist destinations in India, particularly for honeymooners. 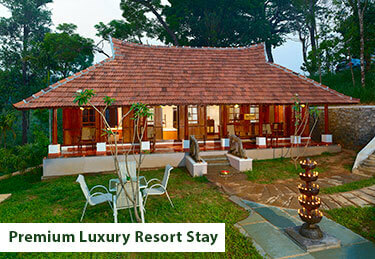 To get the best out of Munnar, you need to stay in the best resorts decorating the town. Finding the best resorts in Munnar is one of the toughest tasks for any traveller wanting to catch the best Munnar tour packages. �Since there is the number of available resorts and hotels in Munnar, locating the best resorts is harder one that we thought. So solving this problem you can refer the following some tips that will help you catch a resort that's perfectly suitable for your tastes and costs. Munnar is famous for tea estates so the best resorts in Munnar has a grassy view of green spilt mountains from the glass windows of the apartment. So when you book your reservation, you just need to check in advance about the tea gardens view from your room with your trip operator. The best feel in Munnar is to have a fresh morning with the refreshing scenes of tea gardens which is quite unique from other tourist�s destinations. The scenic beauty of Munnar in the right way can be enjoyed only when you choose the right resorts for your staying facilities within the margin of maximizing your budget. So along with views of tea gardens, distance from the town of Munnar is also a factor for providing you with a good pleasure trip. Since travelling in the Munnar town through the winding hills is a bit tiring and difficult one. So you need to consider the distance from your resorts before you shortlist your resorts. There are numerous sites like hotels.com and trip advisor that delivers comprehensive tips and reviews from the visitors who have previously stayed in Munnar resorts. So going through this review help you to correctly choose your resorts for your trip. It will help you to correctly shortlist the best resorts in the Munnar town. A good stay in the resort must provide enough entertainment and relaxation to the vacationers and honeymoon couples. Resorts need to deliver unique and quality services to their clients so that they get the best experience for their Munnar trip. So having the good customer service resorts can be also the strategy for choosing the best resorts. Considering your budget is also a factor for selecting your affordable resorts in Munnar. If you cannot meet the expense of the luxurious resort in Munnar, then looking for more reasonable alternatives in which their feature are similar to your expectations are also matters for your tactics for looking on perfect suitable resorts in Munnar. You can catch all these features in Ragamaya Resorts & Spa, where we deliver all the services to our visitors at a reasonable rate. We provide you with a fascinating natural beauty of Munnar together with the amazing views of tea gardens. Have respectful, intelligent and easy hotel planning -Booking for a resort booking should be easy and simple, and you should get all the necessary help that you need. �Discreet, quick and easy Checking & Checkout- Avoid long waiting for check in and check out for the guests; it should be quick and easy. Get the kind of room that you needed- A true luxury hotel will provide accommodations according to your request regarding all elements like room category, physical location in the hotel, a king or twin beds, as you wish; choices like a balcony or a plunge pool and much more. Provide luxury resorts rooms furnishing with all advanced amenities. Have true luxury facilities for bathrooms- Luxury hotel bathrooms have turn out to be an area of pride and scrutiny, a luxury bathroom needs to contain all high tech facilities. You can meet all these luxury factors in the Ragamaya resorts, our luxurious package is usually focused for families, nature fans and honeymoon couples, and we provide them advanced luxury facilities in terms of both quality and service. The charming beauty of Munnar will make you fascinated and the hospitality of us will provide you with a luxurious stay. For receiving an unforgettable experience in Munnar Trip you can approach Ragamaya Resorts & Spa which is a convergence of hospitality and charm. It is one of the best premium resorts in Munnar, always remained as the excellent service providers in this industry. We can guarantee that we can provide you with unique and quality oriented series throughout your journey. We offer a serene environment together with the rich wildlife, sunrise & sunsets and the lush green vegetation of the Munnar.